Not so shiny: Today we present to you Razor Shines, a man who lived life on the edge. He was a sharp dresser who wouldn't be caught dead in short sleeves, let alone cut-offs. Razor was also well-shorn, with a mustache that made the ladies swoon and sideburns so keen they were considered lethal weapons in 17 states and three Canadian provinces. But if there was one slice of life that held Razor back, it was baseball. No matter how hard he tried to hone his skills, he could never pierce the starting lineup. He was dull on the basepaths and his swing was rusty. 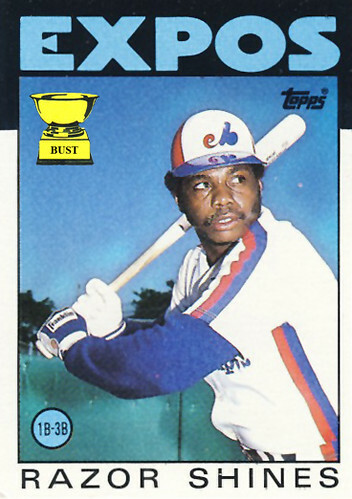 He spent four years with the Expos, posting a slash line of .185/.239/.198, numbers that hacked off his coach. So it was that in 1987, the inevitable happened: Razor was cut. Nothing worse than a rusty Razor.